I just celebrated my 29th birthday at a silent meditation retreat. It was an amazing, cleansing experience for me and though it almost felt like the day didn’t exist, I also felt a huge shift within myself throughout the day. In the morning my head was overwhelmed with thoughts. I couldn’t clear my head or get to the transcendent meditative space I wanted to be at. Mid-morning I went to the mikveh (my retreat was on a conservative kibbutz), and when I emerged from what I like to call “G-d’s womb,” I felt like a new person. I didn’t have a single thought in my head. Not a single memory existed. And for the remainder of my time at the retreat I was in a transcendental trance. Because of this state of mind/soul my Yom Kippur was more meaningful than ever before. I understood almost every word during davening. Wow is all I can say. 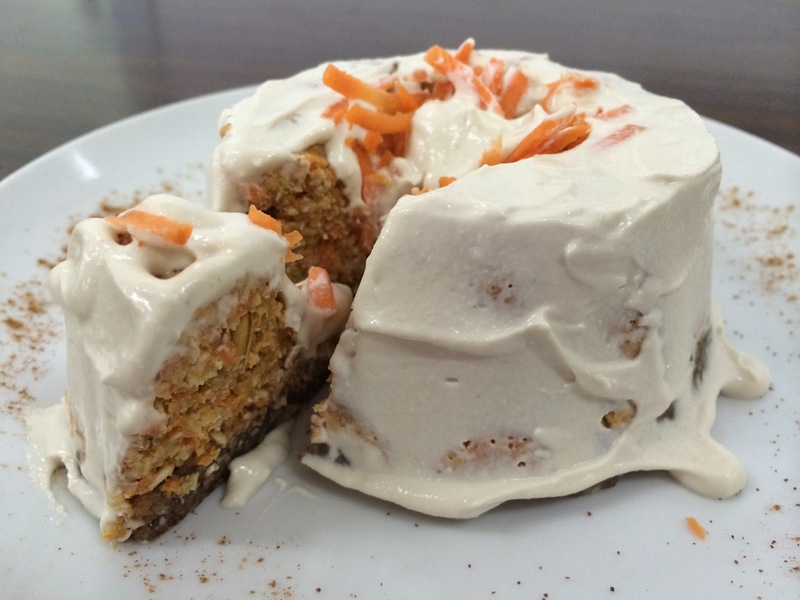 Anyway, I didn’t get any birthday cake on my birthday so today I made myself a small, delicious, raw-luvin’ carrot cake. Enjoy this recipe, and may we all be written in The Book of Life and Love. Process in a food processor for 5 minutes until forming a dough. Press into the bottom of an 8″ spring-form pan. Blend all ingredients in a food processor until well mixed. Press onto the crust. Blend all ingredients in a vitamix until smooth. Pour over the carrot cake and place into the freezer for at least 2 hours. Garnish cake with more orange zest and chopped almonds. לערבב הכל במג׳י מיקס 5 דקות עד מקבלים בצק. לשים בתבנית עוגה. לערבב הכל במג׳י מיקס ולשים על הבצק. לערבב הכל בויטמיקס ולשים מעל המילואי. לשים את העוגה במקפיא לפחות שעתיים. Can you make the came without almonds???? Yes you can make it with any nut! Happy birthday! and thanks for all the tasty recipes!